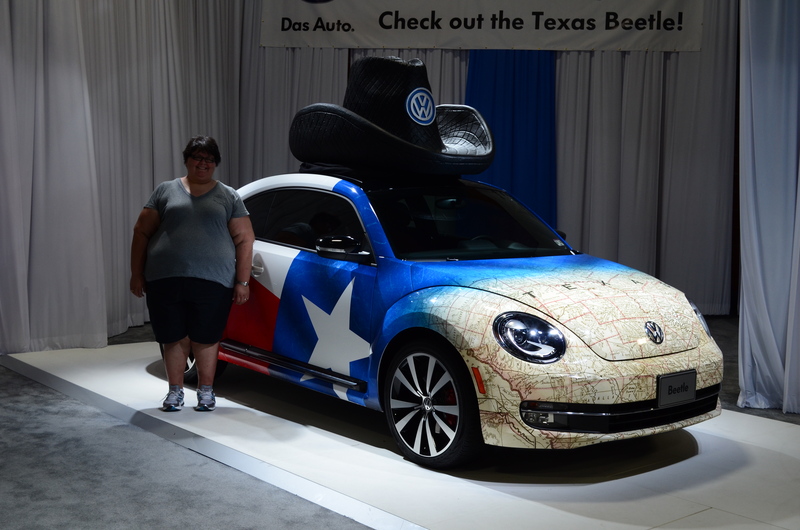 This is me at the auto show at last year’s Fair. I don’t even look like this anymore! This weekend, my husband and I are going to brave the State Fair. We happen to live not terribly far from the fairgrounds, so getting to the fair is pretty easy–we just hop the train and in about an hour, it drops us off at the entrance to the Fair, so we don’t pay to park. This year, we decided that we are going to see the car shows, some livestock, the pig races (!) and the Lucha Libre exhibit, among other things. There is an awful lot to see and do, and the best part really is the people watching: it is PRIME. Because our school districts get free tickets from the Fair’s sponsors for teachers, we have our admission taken care of. Pretty sweet deal, really. So all we have to worry about paying for is food and drink, games if we want to play, and souvenirs if we want them. We generally avoid the games–they’re a racket, and who wants a 5 foot long banana with dreads as a prize anyway? We never buy souvenirs…we have no need for them. If we buy anything, it’s food and water since we don’t feel like carrying our own in. Things I eat once a year, if at all. Going to be limited to a very small quantity. Going to be burned off by all the walking we will do. During the State Fair, Fair Park turns into 277 acres of all kinds of things to see and do, and we’re planning on seeing and doing a LOT. My plan of attack tomorrow is to drink some Isopure to start my day and to boost my protein intake, and to log what I eat, no matter what. There is obviously going to be a buttload of walking done which I’ll be able to track with my Fitbit Flex. I’ve already thought about the foods I want to try and share with my husband. I won’t lie–I’m looking forward to the food because well, that is one reason people go to the Fair: the food. One of the things that the Texas State Fair is known for is fried food. If it can be coated and dipped, it can be fried. I mean, this is the birthplace of Fried Beer, after all. Seriously, think of a food…any food. Chances are excellent that there is a fried version of it at the State Fair. 1. A Fletcher’s Corny Dog: Anyone who goes to the State Fair has to have one of these. Fletcher’s has been making corny dogs at the Fair forEVER, it seems, and they are quite good. They make them fresh right in front of you so you know they haven’t been sitting under a heat lamp getting gross and stale. My husband and I determined that we would split one between the two of us since we figured that’s all we will likely have room for. 2. Smoked Turkey Leg: Every year that I have gone to the Fair as an adult I insist on having a turkey leg. Turkey is one of my favorite meats, and there is something rather primal about holding a giant turkey leg in one’s hand and biting chunks of meat off of the bone. I’ve always liked turkey legs, and this is another thing that my husband and I plan on sharing. Also? Hooray protein! 3. Fried Thanksgiving Dinner: Every year, the Fair has a contest among the vendors to see who can come up with the most creative and best tasting foods to sell. This year, a guy invented something called Fried Thanksgiving Dinner, which is basically a hushpuppy made of cornbread stuffing with turkey meat rolled into it, dipped in creamed corn, breaded with panko, deep fried and served with a side of gravy and cranberry sauce. I’m not going to lie, this intrigues me. If I find it tomorrow, I’m trying it. 4. Fresh Corn on the Cob: I haven’t had any issues eating corn, so I’d like to have some corn on the cob. It’s one of the few vegetables one can find at the Fair that isn’t coated in batter and deep fried. 5. Any of the things listed here. None of them sound particularly good. Here’s what I had today. Today’s protein: 84 grams, so better than yesterday. Today’s food choices, from upper right: Isopure Zero Carb; Sargento reduced fat cheese stick; Goldfish crackers; mini lasagna and green beans almondine; Trader Joe’s turkey meatballs; multivitamin and calcium x2; 1/4 of a chicken, zucchini and onion bowl at Genghis Grill (I skip the starch that is offered). This entry was posted in daily bites, eating, post-op, vsg, weight loss surgery and tagged daily bites, exercise, fair fare, Friday Five, post-op eating, post-op life, State Fair, VSG, vsg realness, WLS. Bookmark the permalink.